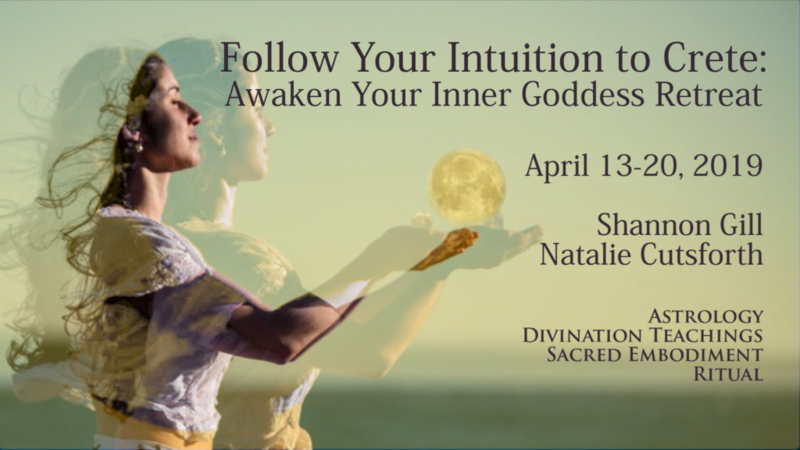 Activate your Female Creative Energy while exploring the magic of Crete as evolutionary astrologer Shannon Gill-Jones and intuitive healer Natalie Cutsforth, lead you in the immersion of an unforgettable exploration of the ancient roots of the Goddess and her gifts of intuition, star-wisdom, sacred embodiment, and mystical connection with your life. Natalie and Shannon will guide you to the sacred sites of the Goddess. On the towering slopes of Mount Ida — the great mountain of the Goddess that sprawls across half the island — you’ll enter the Cave of Zeus, where the Earth Goddess Rhea gave birth to her youngest child. Feel the energy of the Minoan palace at Knossos and the Snake Goddess in the Archaeological Museum in the capital city of Heraklion. You’ll discover first-hand the creative brilliance that flowered in the Goddess-centered culture of Crete. Learn how the consciousness embodied here has influenced our Western culture — and how the astrology of 2019 is awakening it. Shannon will lead you to experience deep recognition of your OWN Divine Feminine essence, through the perfect balance of direct energetic connection to the sacred sites of Crete and astrological teachings. Receive transmission of your personal archetypal Goddess imprint based on your astrological birth chart, sacred embodiment practices, and cosmological teachings to help you connect to the star-wisdom of which you have originated. Through ritual, ceremony, and temple dance practices, you will Re-member your unique Goddess archetypal imprint, and call upon Her in reverence to find alignment and deep sacred embodiment. Throughout our time on Crete, you will deepen and integrate your outer experience with an inner journey. Natalie will lead you in divination practices that allow you to connect directly with your higher self and the Divine Mystery, from ritual to beach walking meditations. Tapping the stream of inspiration that has flowed from ancient Crete through the centuries, we’ll have our own version of the prophecies given by the Oracle of Delphi, a thousand years after the Minoans. You will learn the steps to Run Female Creative Energy to awaken your sensual creatress. Every step of the way, you’ll tune-in to your sixth-sensory intelligence through personal connection with the beauty of this ancient isle. Do you hear the goddess call? At first it may make you uncomfortable, beconing you to awaken memories in your soul that have been hidden for many lifetimes. Together we will receive her message at the sacred gateway to the Goddess – Crete. Immerse yourself in this once in a lifetime journey, with sand between your toes, deep feminine magic, sensually indulgent food, music, dance, and the splendor of the island itself.